The Bee Eaters are on the road again. 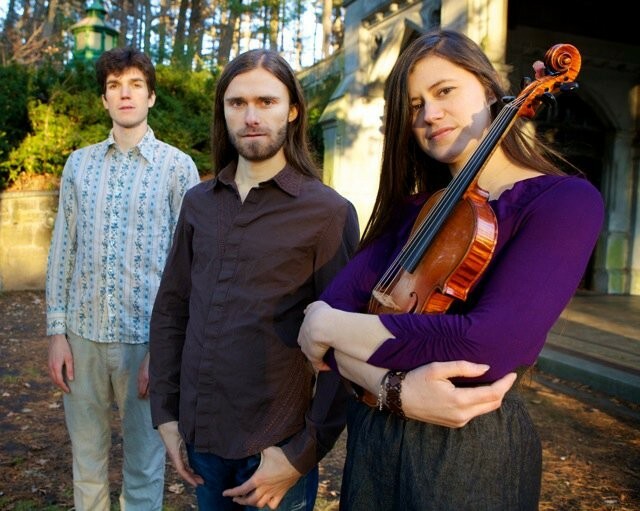 In fact not long after cellist Tristan Clarridge called from the Sacramento Airport, he was getting into a van to head for the first gig on a tour that brings them back to Arcata Friday. The band had just flown in from Nashville where they were mixing a new Bee Eaters record due out in April. "We've been working on the music for a year and a half or so," said Tristan, who along with his fiddling older sister Tashina grew up in the mountains near Hayfork. "We recorded last month at a chapel in Belmont near Redwood City, a place with amazing acoustics recommended by our mentor friend and musical hero Mike Marshall. We recorded with Dave Sinko and he's in Nashville mixing the tracks and putting it all together." Tristan emphasized that Sinko is not the usual Nashville engineer. "You know, the type who makes very produced, maybe contrived, heavily commercialized music, which wouldn't really be suited to our approach at all." The Bee Eaters approach? "I'd say it's like the food we like to eat, it's a very natural and organic approach to sound. We play acoustic instruments and we like to hear the sound of the instruments and not really alter the original vibe too much. Dave is totally in line with that; he an innovative engineer who's worked on a lot of famous recordings." To be specific, in the last quarter century Sinko has recorded Yo Yo Ma, Edgar Meyer, Mark O'Connor, Sam Bush, Mike Marshall, Bela Fleck, Punch Brothers and Uncle Earl along with more mainstream artists like Don Williams, Trisha Yearwood and Dolly Parton. What are the new songs like? "It's hard describing music in words, but it's basically the same approach as our last record," said Tristan. "It's mostly original, mostly instrumental with a couple of covers we arranged. There's one vocal that we're excited to have Bruce Molsky sing on; he's one of our musical heroes. He does a cover of a Bruce Hornsby song called 'The Way It Is.' Tashina picked it out thinking it lyrically relevant to today's times. It has a strong message and we liked that, plus it has cool instrumental parts to work with." Hornsby writes, "Standing in line marking time, waiting for the welfare dime, ’cause they can't buy a job. The man in the silk suit hurries by as he catches the poor old ladies' eyes, just for fun he says 'Get a job.' That's just the way it is. Some things will never change. That's just the way it is, but don't you believe them." That other cover? Michael Jackson's "Thriller." "It was fun to interpret that as an acoustic band," said Tristan. The Bee Eaters features Grand Champion fiddler Tashina Clarridge complimented by Dominick Leslie on mandolin. Simon Chrisman's hammered dulcimer takes the music in a slightly different direction. Tristan is another champion fiddler, has been since he was a kid (they both started at age 2) but he mostly plays cello here. He's fine with that. "I'm really happy to be doing something that I love -- something I spent my life on -- as my job. I feel lucky because unfortunately a lot of people are not; that's not how their lives are set up. [This job] has led to cool things, the opportunity to travel to new places and meet new people all the time. The challenge is to leave time for music after you've sent all your time booking the tour, promoting it, getting in and out of vans. It's all worth it when we play." And it sounds so good. Before they reach Arcata, The Bee Eaters tour takes them back to Hayfork School for a Wednesday show followed by a Thursday gig at Trinity Alps Performing Arts in Weaverville (7 p.m.). Friday Feb. 4, they're at the Arcata Playhouse, 1251 9th St. Showtime is 8 p.m. Tickets are $16, $12 for students, $10 for kids 12 and under. For further details go to www.beeeaters.com.